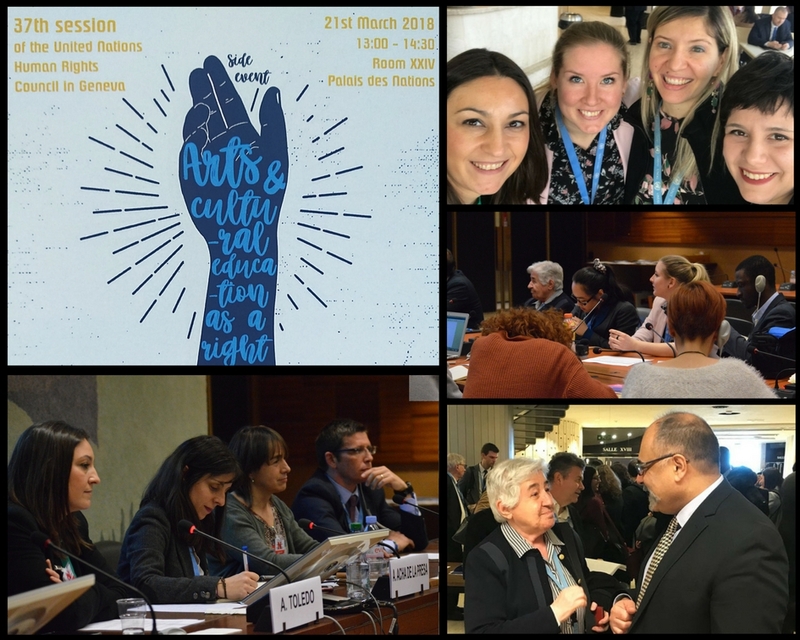 During the 37th session of the Human Rights Council in Geneva, on 21 March 2018, at 1 p.m., in Room XXIV, at Palais des Nations, IIMA and VIDES International co-sponsored a side event entitled, “Arts and Cultural Education as a Right,” which was organized by the Permanent Mission of Spain and UNESCO Etxea. This event presented best practices for Arts education as a tool to promote human rights. In fact, Arts education and creative expression form the basis for quality education and for the full development of the young students. In her opening remarks, Ms. Arantzazu Acha de la Presa, Director of UNESCO Etxea and moderator of the event, highlighted how the development of creativity is a way for individuals to be sensitized on the diverse human rights issues. Ms. Gemma Carbó, Director of ConArte Internacional, emphasized in her message the humanizing aspect of culture, arts, and music because they help the young people to be “more human”. Likewise, she stressed on the importance of teaching the young people to go beyond the scope of academic knowledge, to think as individuals, and to care for others – to be unique. Mr. Emilio Pin Godós, Human Rights Adviser of the Permanent Mission of Spain, in his closing remarks underlined how the arts unite us and do not divide because Arts education helps each of us to interpret the signs of the times and better understand the world. The side event was able to convey the key message that arts and cultural education bring joy and happiness, social cohesion, and progressive development because they generate meaningful dialogue regarding human rights issues among teachers and young people as well as within families.